198 pages, 5.5" x 8.5"
Andy James is the pseudonym for a U.S. Army veteran, current law-enforcement officer and lifelong survivalist. He lives in the Pacific Northwest. 2) What Are We Preparing For? 15) What if Nothing Happens? This book is definitely a good idea and a must have for learning. Glad I stumbled across it. 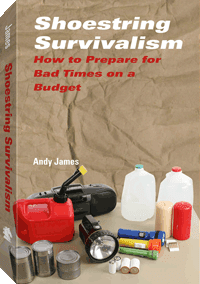 I would say that sites like http://doomsdayprep.co.uk/ also help with providing advice on survival stuff. Sadly, I ordered this during Paladin's closeout sale and it sold out. Thank you again Anonymous, as the New Year approaches, may you and your loved ones find health, happiness and wealth!